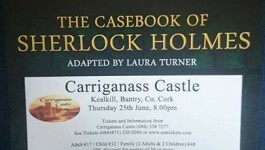 Dan O’Sullivan remembers cows being milked, and grain being stored, in the grounds of Carriganass Castle. His father even made baskets in one of the remaining corner bastions. That was before Dan’s brother, Joe, and his wife Anne, donated the castle to the community in the year 2000, so that it could be restored and made safe for visitors. The community in the local village of Kealkill and the three surrounding valleys rose to that challenge magnificently. The castle was restored to its current state thanks to the contributions of a huge number of skilled local people who donated their time and labour over many years to contribute to this landmark project. The project could not have been completed without the generous provision of support from a number of bodies. The Ireland Funds provided $37,000 in the initial stages, and further support was provided by the West Cork Leader programme which supports rural development. The work also depended on help from private individuals who donated funds towards the costs of restoring the castle, and of developing amenity areas and parking facilities that would encourage visitors to spend time at this historic site. Carriganass Castle is once again part of the life of the community. Each year at Halloween, the castle hosts what must be one of Ireland’s most atmospheric celebrations of a feast that links the present with the past. In the summer, the castle is a popular spot for picnics and paddling in the River Ouvane which passes below its walls. 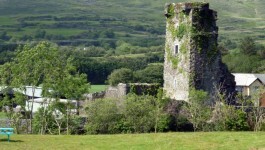 Carriganass Castle is the most significant remaining monument to the O’Sullivan Beare clan. It’s also an important landmark on the map of one of Ireland’s most significant historical journeys, ‘The Flight of the Earls’. It is a tribute to the community – and the commitment of the Carriganass Development Association in particular – that, after many years out of the spotlight, this historic monument is once again a striking presence on the West Cork landscape. The walk from Carriganass to Gougane Barra is the final section of Slí Bharra (St. Finbarr's Way), and follows the traditional route taken by pilgrims from West Cork to the shrine at Gougane on Pattern day - the last Sunday in September. The 'Pattern' or pátrún is the tradition of making a pilgrimage to a holy site on the occasion of a saint's day. Pattern days were an important tradition in rural Irish life from the middle ages onwards, and they may have had their roots in the old Gaelic tradition of aenach or clan gatherings. Pattern day continues to be marked in Kealkill with an annual walk from Carriganass Castle to Gougane Barra. Valley Desmond a thousand wild fountains down to that lake, from their home in the mountains. It lightly laughs back to the laugh of the morning. So meet for the bard as this lone little island?